PA State Rep. Tom Mehaffie - Thanksgiving Wishes to All! From my family to yours, may you all have a safe, healthy and happy Thanksgiving! Adoptees Can Now Apply for Original Birth Certificates…Pennsylvania adult adoptees can now apply for and receive a copy of their original birth certificate from the Pennsylvania Department of Health. Act 127 of 2016 reinstated this access for the first time since 1984 to allow these adults to have the same access to the record as everyone else. The department began accepting early submissions this summer for processing now, and so far 1,180 adoptees have already applied for a copy of their original birth certificate. Adoptees who submit applications on or after Nov. 3 should allow 45 days for processing. Under previous Pennsylvania law, adoptees could petition the courts for a copy of their original birth records; however, that request could have been denied by a judge. For more information on the new law and the application process, click here. Hunters Can Share Their Harvest…For more than 25 years, the Hunters Sharing the Harvest (HSH) program has encouraged hunters from across the Commonwealth to share their deer harvest and provide thousands of pounds of venison to Pennsylvania families in need. The program partners with the Pennsylvania Game Commission, Department of Agriculture and many other sportsmen and charitable organizations. Since 1991, HSH has distributed 1.2 million pounds of donated venison. Hunters can donate all or part of a harvested deer by taking it to a participating processor, which will then distribute the ground venison to food banks and pantries. In an average hunting season, the HSH program’s goal is to channel about 100,000 pounds of processed venison through the state’s 20 regional food banks, which then redistribute to more than 5,000 local provider charities such as food pantries, missions, homeless shelters and churches, as well as individual families. To find a list of local processors or for more information, visit www.ShareDeer.org. Avoid Student Loan Scams…To help students and their families from falling victim to student loan scams, the National Council of Higher Education Resources offers the following advice through an easy-to-understand infographic. Borrowers should remember four points to help keep them safe. •	Notice fake government seals and logos. •	Never pay for help. •	Keep your Federal Student Aid ID private. •	Fast student loan forgiveness does not exist. 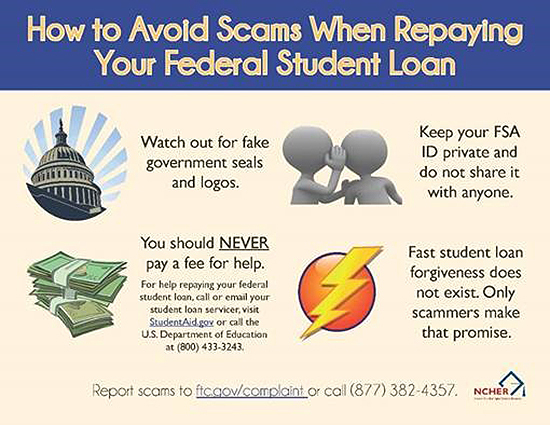 The infographic also includes phone numbers and websites for legitimate student loan assistance and urges borrowers to contact the Federal Trade Commission with information about scams. Traveling Over the Holiday? Check Traffic Conditions on 511PA.com…Travelers can log onto www.511PA.com to check current traffic impacts from construction, traffic delay warnings, weather forecasts, traffic speed information and access to more than 770 traffic cameras. The service is free and available 24 hours a day. 511PA is also available through a smartphone application for iPhone and Android devices, by calling 5-1-1, or by following regional Twitter alerts accessible on the 511PA website. Travelers are always reminded to buckle up, put their phones away and stay sober when behind the wheel. In other PennDOT news, driver license and photo centers will be closed Thursday, Nov. 23, and Friday, Nov. 24. Customers may still obtain a variety of driver and vehicle products and services online through PennDOT’s Driver and Vehicle Services website, www.dmv.pa.gov. I was pleased to congratulate Chief Warrant Officer James Strine on his recent retirement from the Pennsylvania Army National Guard after 33 years of dedicated service! He most recently served as a CH-47F standardization instructor pilot, passing along his proficiency and expertise to the next generation. 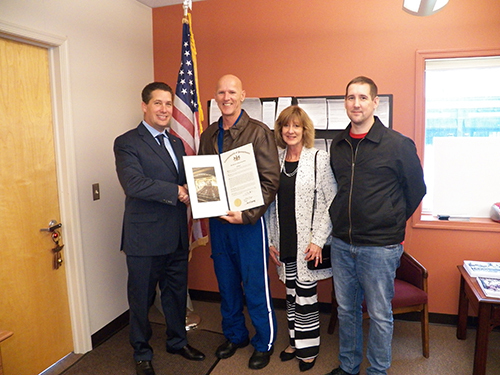 CWO Strine and his family stopped into my Hershey office, where I offered my best wishes and presented him with a House of Representatives citation. Thank you again for your many years of service to our community, our Commonwealth and our country! I stopped by the Royalton Borough Council meeting on Wednesday, Nov. 8, to talk with Mayor Judy Oxenford and the council members about local issues impacting residents. 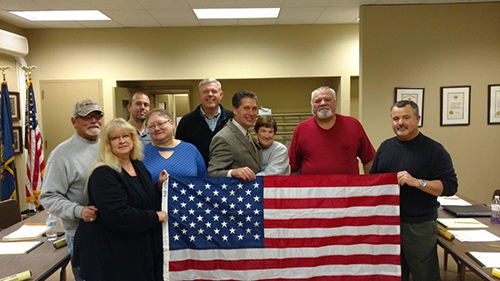 I also presented the borough with a U.S. flag that was flown over the state Capitol. I was happy to accept an invitation from Hershey Area Art Association’s Christine Slates to attend one of its meetings at the Derry Township Historical Society. This group of very talented individuals does wonderful work in our community and encourages local artists of all ages. 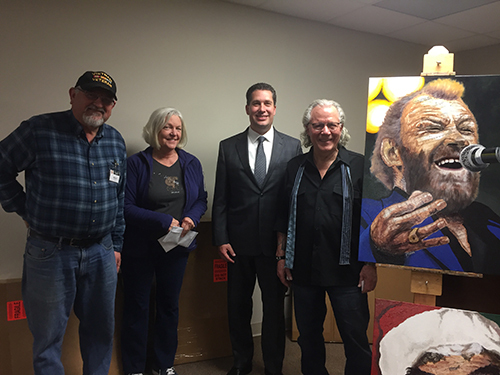 Pictured next to the portrait of singer Joe Cocker (from left) are: Dale Kelley, Christine Slates, me and Fred Swarr, the guest artist. Fred’s work is excellent. I encourage everyone to check it out on his website, www.fdswarr.com.